Learn how nutrition professionals are using Facebook, Twitter, and blogs to network, promote nutrition messages, and receive business opportunities they never dreamed possible. You don’t need to be living in cyberspace to realize that during the last decade, the Internet has taken on a social life of its own. In a world where the telephone, fax machine, and face-to-face conversation commonly take a backseat to virtual communication methods, social media technologies have grown from a way to connect with friends and family into a vital tool for helping businesses and professionals thrive. By providing an outlet for personalized marketing and constant, real-time communication with clients and consumers, social media affords nutrition professionals an invaluable opportunity to get their nutrition messages out to the public and build their individual brand. Perhaps one of the most important reasons for RDs to establish a virtual presence through social networking sites is to market the dietetics profession. “[Social media] has opened up an entire world of opportunities for folks to learn about nutrition and our services,” says Amy Jamieson-Petonic, RD, LD, a spokesperson for the Academy of Nutrition and Dietetics and director of coaching at the Cleveland Clinic. But Kristin Kirkpatrick, MS, RD, LD, a wellness dietitian based in Cleveland, warns that just as credentialed professionals can easily post, tweet, or blog nutrition information so can those without the appropriate expertise. And since nutrition is such a hot topic, there are many social network users posting inaccurate advice. “There’s a lot of misinformation being shared by nutrition want-to-be’s or those just looking to sell their supplements,” says Sheryl Lozicki, MS, RD, owner of E2 Eating & Exercise for Optimal Nutrition, LLC. And that’s why Lozicki believes it’s crucial for the profession to solidify its authority online when it comes to judging and distributing accurate nutrition information. “Registered dietitians need to establish a presence in social media so that the public doesn’t become misguided. If we miss this opportunity as a [profession], we’ll continue to struggle with establishing our identity in the public’s eye,” she says. Social Networking: What’s Not to ‘Like’? One of the easiest ways for RDs to establish themselves is through Facebook, which transformed virtual communication and sparked a social media revolution upon its conception in 2004. What started as an online networking site accessible only with a college e-mail address has since evolved into an international phenomenon used for marketing, networking, and growing businesses both large and small. Marketing through a professional Facebook page allows RDs to reach clients and consumers on a different level by showing their personality through their profile. Possibly stemming from its college roots, popularity on Facebook depends on the number of “likes” a page receives. The more RDs network, the more likes they’ll get, and the more popular their brand becomes—all without spending a dime. As people like a page, it subsequently shows up on their own Facebook wall, making it visible to hundreds of their friends—and so on and so forth. Lozicki’s Facebook page (E2 Dietitian) establishes her brand by explaining who she is and the objectives of her business and by providing links to her website, blog, and Twitter account. Her Facebook wall highlights recent articles of interest she wants her followers to read. She posts articles and visuals on everything from women’s stroke risk to dementia to nutrition labeling, school lunches, sodium intake, and mindless eating. Through Facebook, “friends” of E2 Dietitian get a personal sense of Lozicki as an RD as she posts pictures and updates related to the activities she’s participating in, fun recipes she’s encountered, or her thoughts related to nutrition. But dietitians using Facebook for marketing purposes also may want to be wary of getting caught up in the social aspects of the site. Facebook originated with the sole purpose of personal networking and though it’s become a great platform for business professionals, it’s still widely used for personal reasons. “My biggest piece of advice is to not merge your business and personal accounts,” Kirkpatrick says. “They should be separate to ensure privacy and professionalism.” Using the privacy settings that Facebook offers allows users to dictate who can view, post, and join their page, thus protecting the integrity of their professional brand. To Tweet or Not to Tweet — Is There a Question? One of the latest rages to hit social media is the microblogging site Twitter, which started in 2006 and has since exploded with more than 100 million active users. Twitter provides its users with information on their interests in real time, allowing them to search for people, groups, businesses, or topics and follow their conversations daily. When users choose to follow someone, they automatically receive updates from these sources straight to their personal account. Now a household word, a “tweet” is what drives the network; tweets have a limit of 140 characters and can include any type of information. Just like Facebook, Twitter is becoming popular for professional use and can provide endless networking opportunities for nutrition professionals. Twitter’s potential to generate followers is its biggest allure, opening up a world of potential clients that RDs may not have otherwise reached. Another fascination with Twitter is that it stimulates direct and immediate conversation. RDs can engage their audience and get immediate feedback, allowing them to instantly see how effectively they’re reaching their target audience. Amber Pankonin, MS, RD, CSP, LMNT, a freelance writer, educator, and nutrition consultant based in Lincoln, Nebraska, and the voice behind “Beginning Well,” is an excellent example of how RDs can generate a well-known brand through social networking sites. “I constantly meet members from the community that call me by my Twitter handle [@RDamber] in public when they recognize me,” she says. Kirkpatrick, who’s been on Twitter only for a short time (@EATPRETTYWITHKK), has seen her Twitter persona benefit from the popularity of her blog. “I don’t know how they find me,” she says, “but when I submitted a blog, I immediately received several e-mails saying that I had more followers on Twitter.” This kind of cross-referencing is paramount to effectively using multiple social media technologies to establish a virtual presence as a professional. Kirkpatrick’s blogs, for example, have a link to follow her on Twitter or like her on Facebook. Kirkpatrick points out that constantly cross-referencing one’s virtual identities in this way creates a “spiral effect” so that someone who chooses to like her on Facebook after reading a blog entry now has made her blog visible to their entire network of friends, further marketing her brand. In this same spirit, Kirkpatrick tweets the links to the new blog entries she writes. While establishing a presence via social media can help RDs expand their brand and connect with the public, it can generate business opportunities. Lozicki, who’s popular with almost 3,000 followers on Twitter and more than 350 likes on Facebook, has taken advantage of the financial opportunities that have come her way. Through her use of Twitter, for example, she contracted with a multinational food and pharmaceutical company to write 365 heart-healthy tweets; this opportunity then led to her writing three of the company’s position papers on nutrition and disease prevention. Lozicki also offers a few guidelines when using social media. Her first rule, as simple as it sounds, is to always log out, she says. “Social networking rules apply: Play nice, spell check, use good grammar, and think twice before hitting enter.” One last piece of advice from Lozicki is to add your Twitter and Facebook URLs to your e-mail signature, which provides one more opportunity to cross-reference your brand. RDs reluctant to ride the social media wave may want to reconsider, as it’s becoming increasingly apparent that the definition of successful communication skills now includes the ability to navigate virtual spaces. It’s important not to fear social media but to embrace it because it has the power to become a lucrative business partner. RDs who are new to using social networking technologies but want to take advantage of the opportunities they provide to market their brand shouldn’t feel completely lost. There are resources available to help dietitians get started. — Christina M. Barth, BA, is a recent graduate from the Accreditation Council for Education in Nutrition and Dietetics coordinated program in dietetics. Here’s how to develop an online presence built on integrity so you can post, tweet, and blog nutrition messages and have a positive influence in the dietetics social media space. 1. Show integrity. Treat the statements you make online as if you’re making them face to face. 2. Remain authentic. Always state who you are and who you represent when posting online. 3. Stay civil. If you disagree with a post, respectfully disagree while acknowledging different viewpoints, being considerate of diverse opinions. 4. Take precautions. Always safeguard personal information, and remember that once information is posted online it stays online. 5. Show professionalism. Always remain ethical, and keep professional and public lives separate. Be cognizant that behavior online affects the reputation of individuals, employers, and organizations as well as the profession as a whole. 6. Keep info confidential. It’s not appropriate to divulge sensitive patient information or discuss clients in a way that violates their privacy. 7. Value originality. Posting trademarked or copyrighted content or intellectual property is never allowed. Give credit where credit is due by citing the source of your information and ideas. 8. Scrutinize your online presence. Monitor your virtual identity routinely to ensure your information is accurate and credible. • The Nutrition Blog Network (http://nutritionblognetwork.com): This website provides a directory of nutrition blogs written by RDs. Blogs are listed by categories such as diabetes, disease management, fitness/sports nutrition, gluten free, pregnancy, and others. The website has a page for frequently asked questions, news, and submit your blog pages. 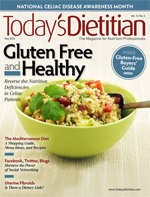 • Dietitians-Online.com: This website is chock-full of information and resources for nutrition professionals looking for a directory of online dietitians broken up by specialty, dietetic associations, dietetic practice groups, and CPEU providers; dietitian blogs, news, and books; social media dietitians; social media pages, and more.